Let’s face it. These days, we don't walk into a restaurant without knowing if we can at least get a decent photo op out of it. So we’ve made it easier for you by rounding up a list of our prettiest finds for your next smize session. True to its goddess origins, newcomer Persephone serves season after season of trendy dishes that are as pretty as they are tasty. A unique mix of Filipino, Japanese, and Korean influences livens up the palate with refreshing flavors and interesting ingredients (read: liver-based pasta sauce). Not to mention, that gorgeous floral wall channels springtime all year round. With its quaint interiors and tucked-away location, Apéro is a dream come true for those who wish to escape the noisy riot of the city. Plus, their cascading menu means you can enjoy a variety of dishes at different parts of the day, from freshly-baked bread to hearty brunch entrees, right down to their refreshing cocktails. And girl, their Intellegentsia cold brews are smooth AF. Early Night? graces its establishment with inch after inch of eye candy—neon signs, colorful interiors, vine walls… you name it. 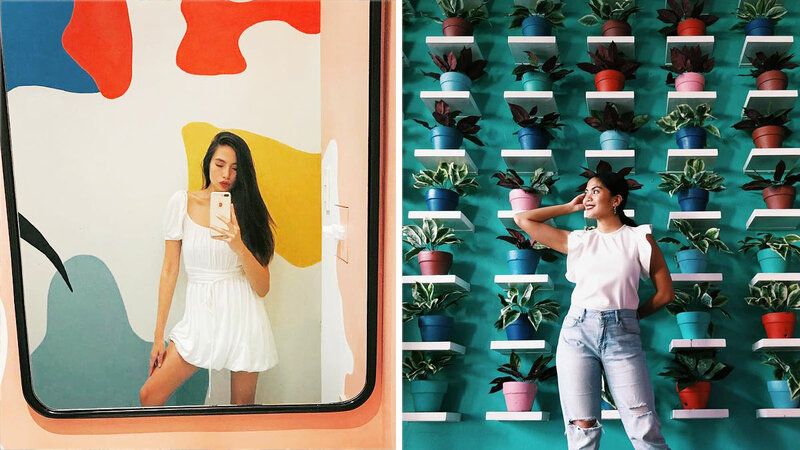 And if you still haven’t had your #OOTD shot against this beautiful pastel plant wall, then you haven’t been going out enough. Who would have ever thought to put Ping-Pong rackets on the wall? That's just one of the many quirks of this Chinese-American fusion restaurant, whose culinary defiance just makes their dishes all the more appealing. One order of those Scotch Eggs, please! This place is a treat for all your senses. A listening room with a laidback vibe, classy interiors, and an impressive menu of specialty coffee and cocktails, Oto is sure to be your next weekend vice. The Lost Bread looks, feels, and tastes like a dream. One just can't help but fall in love with this uber kawaii spot the moment they step inside. And doesn’t that milkshake just make you wish you had a cute boy to share it with? Um, is there any corner in this café that is not gram-worthy? The food, the decors, even the bathroom begs to be photographed! If there’s any place you can go full Insta-hoe in, this would be it. Those familiar with the Cebuano restaurant gem will love its Manila branches in Makati and Tomas Morato, which both bring the extremely photogenic wine cellar closer to its Luzon fans. And have we mentioned how much we love their macarons? Trés magnifique! Ah, nothing like red brick walls to add a pop of color to your feed. Throw in a couple of deer heads, a few designer plates, some unusual clocks and other knick-knacks, and you’ve got yourself an instant photo hit. There’s always room for dessert… and plenty of selfies. Besides those crazy dessert concoctions Freezer Burn is famous for (shout out to that Ketchup & Mayo ice cream), we’d say their color-coordinated corner is looking pretty sweet as well.